Planting in pots is a viable option for many flowers, trees and shrubs. They can then be moved anywhere you want, including indoors during the winter months giving you more options when planting perennials. Ceramics are often the pots of choice with many gardeners. They can be painted, glazed or remain natural, and shapes vary to meet your taste. Consider a few things when purchasing your ceramic pots and incorporate few techniques when planting to help your plants thrive. 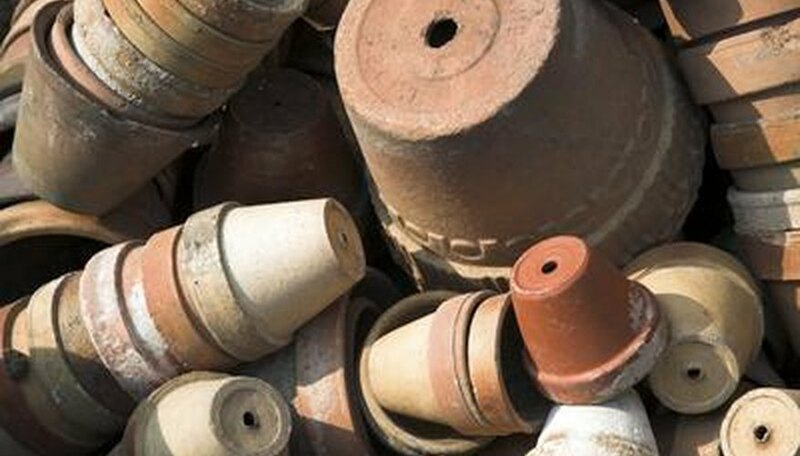 Look for ceramic pots that has at least one drainage hole. This will allow excess water to seep out the bottom so the roots do not become waterlogged, which causes root rot. Purchase a ceramic pot that is glazed, if desired. Glazing makes the pot nonporous and therefore, it will hold moisture longer than pots that are not glazed. You will therefore have to water less frequently and not worry about the soil drying quickly, especially in hot weather. Choose a ceramic pot that is light colored. The sun will not penetrate lighter colors as much as darker colors. The soil will be able to better maintain moisture. Place a layer of small rocks or broken pottery in the bottom of the pot so the soil does not seep out the drainage holes. You can also use a screen mesh. If your pot does not have drainage holes, fill the bottom with 1 to 2 inches of rocks or pottery shards to help prevent the roots from becoming waterlogged. Fill your pot with potting soil. Usually, all-purpose potting soil will suffice for most plants, but there are specialty soils as well, such as ones designed for cacti. Leave about 1 to 2 inches from the top of the soil to the pot’s rim. Plant your plants. In general, plant them to the same depth as they were planted before. Set the pot in a shallow container for the water to seep out into. Many ceramic pots come with a saucer. Be sure to dump out any excess water so the roots do not become waterlogged. Put your ceramic pot on a plant stand or on pot feet if you are placing it outdoors on wood, such as on a deck. This will prevent the wood underneath from constantly staying moist, which will cause it to rot.